Aviation is undergoing a revolution driven by advances in unmanned aircraft system technology. The commercial applications of UAS are just being explored and developed. Unmanned Aircraft Systems are not just another tool to obtain images or data, the FAA considers UAS to be aircraft operating in the National Airspace. 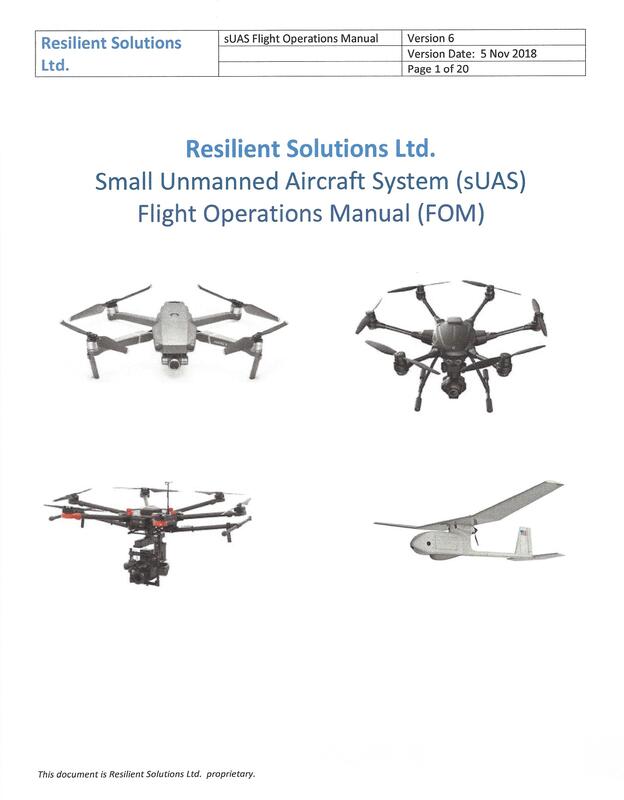 Resilient Solutions can guide you through the required regulatory, safety, training, and operational considerations of using Unmanned Aircraft Systems in your business. The RSL approach keeps your organization compliant with the FAA’s regulatory requirements and aligns your operation with aviation industry best practices. In order to “make the safety case” you need established systems and processes the FAA recognizes. RSL flight operations manuals and safety programs provide the foundation for safe, compliant UAS operations. • Roles and Responsibilities: Chief Pilot, Safety Officer, and Remote Pilot in Command. • Flight Crew Training, Qualification, Annual reviews, and Currency. • Relevant documents: Aircrew training records, Aircraft maintenance logs, Approved aircraft configurations. • Flight Planning: Operating limitations, Weather and wind, Battery management, Air Traffic Control Coordination, Operating Site Assessment, Pre/Post Flight Inspections and Briefings.